So the heat is still an issue and so is my inability to do anything with my hair! But we have to eat. I found the recipe for mini meatloaf on the Food Renegade site. It was an interesting recipe that used Chorizo in the meatloaf. 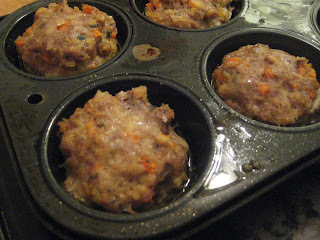 But what I found more interesting was making the meatloaf in muffin tins. I have heard of this but I never thought to try it. The cooking time is obviously less so that was good. I made a basic meatloaf. I sauteed carrots and onions. Added the meat, some ketchup, mustard, salt, pepper, egg and bread crumbs. Chris popped them in the oven for 25 minutes and presto! I like to make meatloaf in muffin tins -- great portion control when it's just Mr. Rosemary and me. But I love the idea of chorizo. Must try.